U.S. auto sales hit record levels last year. GM's chief financial officer argues that 2015 wasn't a peak, but rather the beginning of a "plateau", with a few more years of good sales yet to come. Here's his case. GM's chief financial officer, Chuck Stevens (far right) appeared with global product chief Mark Reuss, CEO Mary Barra, and GM president Dan Ammann at an event last fall. Stevens explained this past week why GM thinks that the U.S. market for new cars is still in good shape. Image source: General Motors. 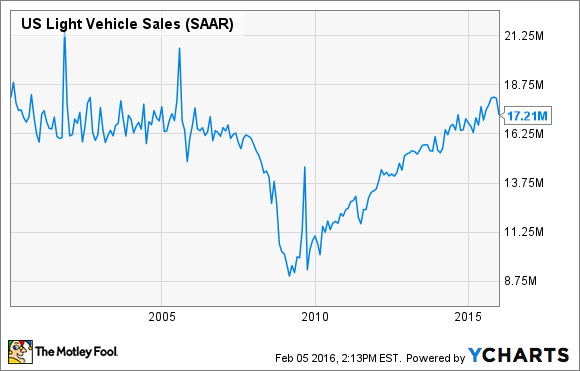 Have U.S. auto sales peaked? Or have they just hit a very strong plateau? Clearly, at least some investors think that last year's record sales numbers were the top of the market, and it's all likely to be downhill from here -- if not now, then soon. Those views weren't helped by the cautious guidance that some automakers gave for 2016 early in January. Investors' fears that auto sales (and thus automakers' profits) are set to think made January a punishing month for most automakers' stocks. Ford (NYSE:F) fell 14% last month, General Motors (NYSE:GM) was down 11%, Honda (NYSE:HMC) lost over 12%, BMW (NASDAQOTH:BAMXF) fell 19% ... the list goes on and on. Only a few of the big names, most notably Toyota (NYSE:TM), escaped the month with relatively minor damage. But what if investors' fears are overblown? What if the market for new vehicles in the U.S. isn't past its peak, but is instead at a strong and profitable plateau? That's the argument that General Motors made this past week. During GM's earnings presentation on Feb. 3, CFO Chuck Stevens called up the following slide. The strong performance in North America for GM, as well as for the industry in general has sparked a debate whether the U.S. industry is peaking or plateauing," Stevens said. "The bears argue the industry in the U.S. has peaked and is ready to roll over. They often cite the fact that the U.S. auto industry is in its seventh year of expansion, [automaker profit] margins are as good as they get, and a recession is right around the corner, really more akin to a scenario that we saw in 2007." I'm not sure how many people are arguing (at least out loud) that a U.S. recession akin to what we saw in 2008 is "right around the corner." But certainly, as I noted above, some investors and market-watchers are thinking that the pace of U.S. auto sales might start to decline from here. Stevens continued. "On the other hand, a number of people, including GM, believe the industry is plateauing with many years of strong performance ahead, similar to the 2000 to 2007 timeframe after the industry peaked in 2000." Here's a look at how U.S. sales of "light vehicles" (cars, pickup trucks, and SUVs) have performed since 2000. The number tracked on the chart is the "SAAR", for "Seasonally Adjusted Annualized Rate". The SAAR expresses the annualized pace of light-vehicle sales in a given month. U.S. light-vehicle sales were moving at a brisk pace in 2000, a pace that continued to be steady (with a couple of spikes caused by big monthly sales events) until it started to drop off in 2008. What Stevens is saying is that GM thinks that today's situation is more like 2000, with several years of still-strong sales yet to come, than like 2007 when a major drop was imminent. He went on to make his case. "We believe that industry fundamentals, such as the age of the vehicle fleet, firm used car pricing, credit availability, and low fuel prices remain supportive [of a continued strong market]. And overall, car manufacturers are in much better health [than they were in 2007], with lower inventory levels, lower breakeven points, and strong capacity utilization. "In addition, household balance sheets are strong, the labor market continues to improve, and forecasts are calling for the U.S. economy to continue its expansion, albeit at a slow and steady pace." In other words, there are still a lot of older cars out there that will need replacing over the next few years, used-car prices are still high enough to make new cars appealing, lenders are lending to car buyers, gas is cheap, and consumers are in good financial shape. All of that, in Stevens' view, adds up to a still-strong market for new vehicles in the U.S.
"Combining strong industry fundamentals with the positive economic backdrop gives us confidence that the industry can sustain a strong SAAR in the mid-17 million unit range for a number of years," Stevens concluded. Is he right? Will the good times continue to roll for a while longer? Stevens is right that the fundamentals of the U.S. economy, particularly the factors that support new-car sales, still appear to be sound. There's no acute reason to believe that the U.S. is about to slide into a recession, at least not in the indicators he cited. That said, some investors worry about the ongoing global effects of super-cheap oil and other commodities, and about the effects that a major economic retrenchment in China (where GM is the biggest-selling automaker, incidentally) could have on other regional economies including that of the United States. But long-term auto investors know that autos are a cyclical business. The things that GM can control -- its efficiencies, its product quality, its balance sheet -- are all in good shape. And two years into her tenure, we can see that Stevens' boss, CEO Mary Barra, has an extremely good handle on the fundamentals of GM's global business. Long story short: If you're the kind of investor who buys good companies and holds them over the long term, there's no reason to sell GM (which has become a very good company over the last few years) -- whether you think the next U.S. recession is five months or five years away.